In my last post, I went through the Ace Hardware Facebook case study. I understand that some of you small business owners might be thinking that their efforts aren't applicable to what you can do as a much smaller business. That is simply not true. None of what they did is beyond the budget of a small business, especially with the right technicians. In this post, I am going to examine another Case Study from the Marketing Sherpa document I referenced in my last post. This one is on a much smaller business, New Belgium Brewing Company in Colorado. Whether you are talking about newspaper, TV, radio or digital advertising, small businesses target locally. They have to! Most of them have a solid customer base right around their presence. Through social media, businesses can create local, regional, and even national campaigns that feel very local. The Belgium Brewing Company (BBC) had a not so unique problem that they had to deal with in their industry. There was growing demand for a product that their brewery had yet to produce. Even worse, their type of brewery (Belgium) doesn't even make this type of beer. Recognizing a shift in demand for the India Pale Ale (IPA), a more "hoppy" beer, they decided that they had to step up to the plate and play the game. Because the IPA had grown in popularity, the Belgium Brewing Company had to be very effective with their marketing effort. They would be pushing their message amongst several other competing messages. With a proportion of 1/2 digital and 1/2 offline, BBC used Facebook, a small, custom website, in-store displays and events to promote their new IPA. They felt that this approach would help make local connections in the 26 states that they serve. By having a VERY strong understanding of who they were targeting (male, 30s, college educated, progressive, urban dwellers, etc...) they knew that they would not be looked to for an IPA beer and those looking for an IPA would walk right past the stack of BBC IPA in a store. They also knew that their target audience favored local craft beers, so they would need to make a local connection to steal market share. Step 1 was technically learning and knowing their target audience and the market they would be competing in. This includes developing a solid IPA to sell. It also included creating a story to go along with their IPA offering. Step 2 was to establish a micro-site just for the IPA. They called the site Rangerland and used it as the target website for most of their campaign. On the site, they shared product photos and information with a heavy emphasis on the hops. 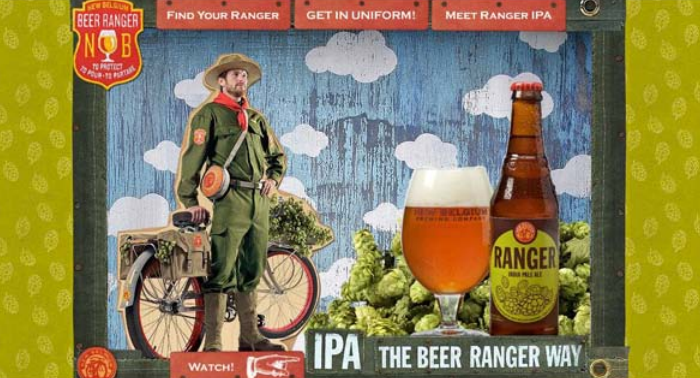 The micro-site included a tab (seen above) labeled "Find Your Ranger", making it easier for users to make a local connection to the beer in their state. When a user found their local rep, they could connect with him/her on Facebook through the Rep's personal facebook profile, see a picture of the rep and also see some personal info about the rep. The micro-site integrated social media by providing an upload feature that allowed you to put your face on the ranger and share it on Facebook. BBC has a nice collection of videos on their site and even made a rap video for the IPA. This type of video goes viral very easily and is a blast to make. Step 3 was to include the "Find Your Ranger" map on their facebook page. With over 70,000 fans already, BBC wanted to capitalize on this volume and have them connect with local Rangers as well. They took the map from their micro-site and created a custom tab with it. When a user found a rep, they could then visit that rep's profile on facebook. Step 4 was to promote the heck out of their online presence and of course, the IPA. Through Launch parties at some proprietors' facilities, Case displays and signage, and event branded giveaways, they achieved that goal. At some of the launch parties they even had live bands. Step 5 was to drive traffic to the stores and micro-site through magazine advertising. Although many brands have backed off of print ads in the past couple of years, BBC has maintained their marketing spend in this area and it really helped with the IPA campaign. OK, But Did ALL Of the Effort Pay Off? Yes indeed! The team passed their 3 months sales goal in half that time and they were on target to be the #2 best selling IPA in the country by the end of 2010. In terms of social media, they about 7,000 new fans, adding 7,000 new users that hear about BBC regularly through Facebook. The micro-site was another huge success with roughly 100,000 unique visitors in 2 months and an average time on site of 5-7 minutes. That is a decade on the web! I think the single most important aspect of this case study was that the New Belgium Brewing Company didn't JUST use Facebook or the web. Instead, the setup events, signage, a micro-site AND a Facebook page. Too many small business owners look at Facebook on it's own. It's most effective when it's coupled with other marketing options.